The down draft spray booth has two major functions: provide a clean working environment for paint refinishing, and efficiently remove paint overspray from the booth. A down draft spray booth draws air through the air make-up unit where air is prefiltered and preheated before it enters the spray booth through the plenum. The air make-up unit can be found on the roof of the spray booth, on top of the spray booth, or mounted through the wall of the spray booth. As air enters the spray booth plenum, where it is directed down vertically through diffusion media filters located in the ceiling of the spray booth (DS-560 Premium Intake Filters). As air is drawn through the diffusion media filters, it passes around the article being painted and is drawn through the exhaust filters located in the floor or the pit of the spray booth. 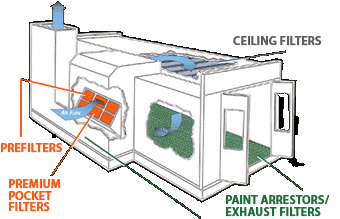 After the paint overspray passes through the exhaust filters, the air is drawn out by the exhaust fan, and up through the exhaust stack. Most down draft spray booths basically use a three stage filter system to filter incoming and outgoing air. These filters are the pre-filters / pocket filters, ceiling filters / diffusion media filters, and exhaust filters / paint arrestors. Prefilters remove coarse particles from entering the spray booth plenum and reaching the diffusion media filters. Prefilters are critically important to extend the operating life of diffusion media filters, typically the most expensive filter in a spray booth. Spray booth manufacturers, have varied in their approach with prefilter, which are located in the air make-up unit. Most common prefilters are polyester pads, panel filters, or pocket type filters. All of the aforementioned prefilters are available for purchase at BoothFilterStore.com. Exhaust filters (also known as paint arrestors) are located in the floor of the spray booth, generally under grating. 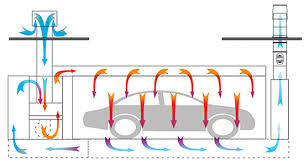 These filters are properly designed to efficiently collect paint overspray yet not restrict air flow. Exhaust filters are also critical to prevent paint buildup in the exhaust system, such as in fans and ducts, and reduce the potential for mechanical breakdown. BoothFilterStore.com offers a range of exhaust filters / paint arrestors to give your spray booth the proper balance between efficiency and operating life (XD-22F and RD-15F). And all of our exhaust filters / pain arrestors have been tested to comply with National Emissions Standards for Hazard Air Pollutants: Paint Stripping and Miscellaneous Surface Coating Operations as Are Sources (also known as 40 CFR Part 63 HHHHHH). Proper maintenance of all filters in your down draft booths are necessary to insure your spray booth is working at its best.